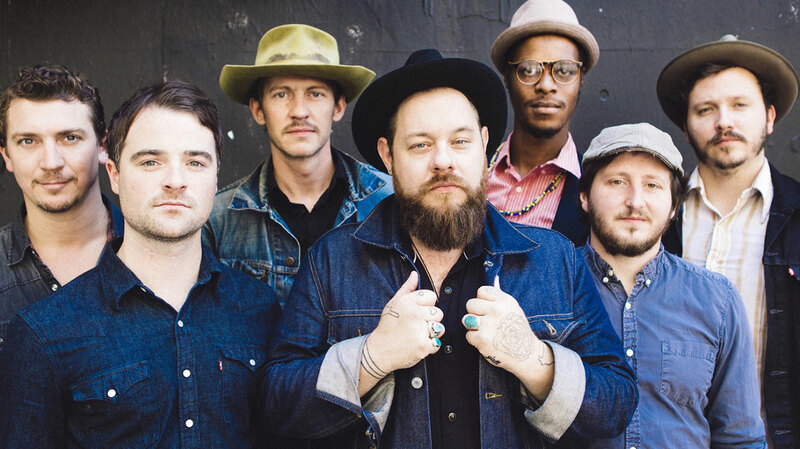 By swapping folk for soul – and solo working for fronting a seven-piece band – Nathaniel Rateliff has landed himself a deal with legendary R&B label Stax Records, and can now count Jimmy Fallon and Questlove amongst his rapidly-expanding fanbase. We caught up with the Denver-born songwriter to hear the story behind his eponymous debut with The Night Sweats, which was produced by Black Keys-collaborator Richard Swift. Hi Nathaniel, how was The Tonight Show? It was great. You know, it was incredible to be on the show, and for [Jimmy Fallon] to really hype up the audience... We didn’t expect him to make such a big deal out of it, and he seemed pretty enthusiastic, so I guess that we were pretty excited by it too. Since forming The Night Sweats you’ve shifted from folk music to soul. What inspired that change? Soul music has been something I’ve loved to listen to for most of my life, and it’s been something I’ve been wanting to write and record for a long time as well. It just took a while to figure out to how to not make the songs too cheesy. Can you tell us about some of the soul artists that have influenced you? I’ve always been very influenced by Sam & Dave, Otis Redding, Booker T. & the M.G.’s, James Brown and Sam Cooke. A lot of different stuff has influenced me, so then also acts like The Band. As a long time soul fan, it must have been a huge honour to sign with Stax Records? Oh yeah – it is extremely exciting to be part of a roster of legendary artists. We were surprised that we could make it happen but everything’s going great. And as more people start liking our music, you see everybody [at the label] getting more excited. Can you tell us more about the writing process on your new album please? I started writing these songs about two years ago, and I ended up just working by myself at home, and recording a bunch of them. So when we went into the studio with Richard [Swift, producer] I had 36 songs – most of them finished and demoed and recorded, but some just as sketches . We recorded 15 of the songs that I was most excited about and then, when they were all done, we figured out what we thought would be best for the record. So you write all the songs, and there’s no collaboration with the rest of the band? Well you know, now that we’ve been playing the songs for a while the live versions are changing a little bit, so there is definitely more collaboration than there was in the beginning of the writing process. And we’re talking more and more about continuing to record new things live, together as a band, too. But they didn’t play on this album? No, it was me. Patrick Meese played drums on some songs and guitar on a couple of others, and then we had horn players come in, but I played guitar and bass and drums and sang. Also, on the demos I played pedal steel, but we got people to come in and play pedal steel on the record. I started recording it last August, with Richard Swift at his studio, National Freedom. It’s in a little town just out of Eugene, Oregon. How did you come to work with Richard Swift? How was Richard to work with? He just makes the songs sound great, you know. He knows how to use his equipment really well and he has great ears. He doesn’t really mess with the song, either; he lets the song be what it needs to be, and really helps serve it. Yeah, I think he’s really been making a name for himself for producing, especially among musicians and peers. Everybody loves Richard. Can we talk about the lyrics on the record, please? Has the shift from folk music to soul altered your lyrical approach at all? Could you tell us more about the background to ‘S.O.B.’ please? I wrote it as a joke, but what it’s about is a situation where I was actually in London and I quit drinking while I was there. I was alone and I ended up having DTs – delirium tremens – so I thought I was having heart palpitations, and I was having hallucinations from not drinking. It was pretty miserable, so I kinda tried to make light of that situation, or more the fact of me having a struggle with alcohol. Do you always write autobiographically? That’s the thing, I feel like at the time when I’m writing the songs, I usually don’t really know what it is I’m drawing from or writing about, and later on I discover. But I draw from situations surrounding me too; it’s not always about what’s personally happening in my life. For a while I wanted to call [the album] ‘Trying So Hard Not To Know’ but then I thought it was a little bit heavy-handed. I feel like the album is full of hopeful songs about love and failure. I really like ‘I’ve Been Failing’. We play a different version of it live, but Richard [Swift] really helped shape that one, and he’s playing piano on it. It was a really fun day of recording it, and it just ended up having this really cool feel. What do you hope that listeners take away from the album? I hope that it’s a record that people can put on that they want to listen to and dance to, you know? And that they want to flip it over and listen to it again after it’s done. I have a bunch of shows here in Colorado and then at the beginning of September I’m gone until the end of November pretty much. We’ll be back in Europe and the UK in September and October. Presumably this new material must elicit a very different audience response to your previous material? Yeah, definitely. It’s also pretty difficult to perform in comparison to the old stuff too. I mean, it can be difficult but I definitely like playing shows. You’ve been releasing records for about eight years now. How have your motivations changed in that time? And what have you learned? Everything’s pretty much the same. I mean, my methods are the same: I still just write stuff at home in Garage Band and, in the process of making this record, we did what we always do. And I still play music because I love to play music.